Mad Scientist Steampunk Brain Specimen in a Jar Top Hat | Nerd Much? Top hats as a fashion statement in today’s world is just a bad idea all-around, but if you’re a cosplayer or costume designer, there are plenty of cool top hats out there that will work wonders to take your costume to the next level. And every once in awhile, we’ll come across one that’s worthy of the eyes of our readers, meaning it’d be impossible for us to not share. With that in mind, check out this ridiculously awesome Mad Scientist Steampunk Brain Specimen in a Jar Top Hat. It was created by Sheena’s Bella Bows shop, a high quality headwear maker on Etsy who has tons of unique designs. 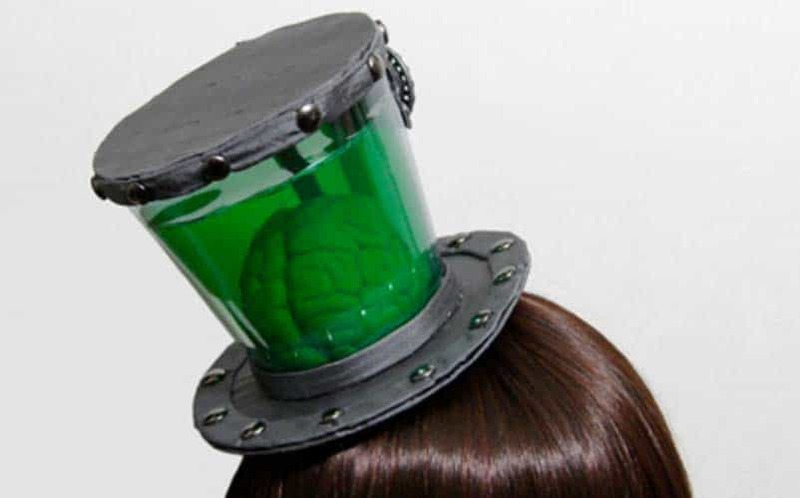 This brain specimen jar top hat doesn’t actually contain any liquid, but it looks like something you’d find in a mad scientist’s lab. The brain, itself, is made out of lightweight foam, so the top hat isn’t top heavy (see what I did there?). What’s more, there are some crazy costume designs in the company’s online store (you know, in case you’re looking for ideas for what to pair your new top hat with). Steampunk meets mad science? Count us all in. For more cool nerd stuff, stay tuned to Nerd Much for daily finds. You can also follow us on Twitter for updates and jokes that only we’ll find funny, anyway.